I recently purchased it, thank you! In this book, doctors are encouraged to be smart business entrepreneurs. Medical journals discuss adding courses to the medical school curriculum on how to run a business. The Internet is replete with business coaches – some of them former doctors – who will offer advice and on-going support designed to increase profits. 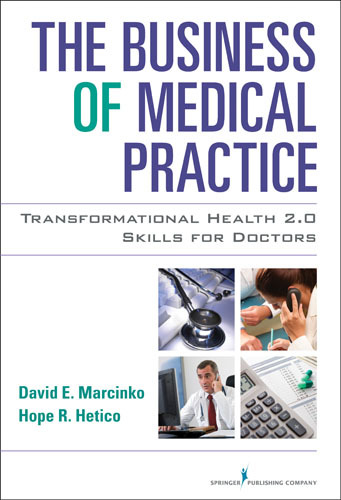 On Amazon one can purchase The Business of Medical Practice: [Advanced Profit Maximization Techniques for Savvy Doctors]. On medical blogs, doctors share their advice on things such as how to sell pharmaceuticals directly to patients. Doctors are often highly trained in the field of medicine, but are not taught about the daily aspects of operating a client-centered, yet profitable practice. This comprehensive multi-authored text contains over 450 pages of highly specific and well-documented information that will be interest to physicians in private practice, academics, and in medical management. The book is organized into three sections: Qualitative Aspects of Medical Practice, Quantitative Aspects of Medical Practice, and Contemporary Aspects of Medical Practice. Appendices include sample management service agreements, and information on medical unions and public perception of physician salaries. A particularly useful feature is a brief biosketch of each contributor, complete with contact information. This is the practice “Bible” for all physician owners and physician financial advisors. With thirty seven chapters and over 700 pages this is mandatory reading on the topics related to all major topics covering the qualitative and quantitative aspects of the business side of today’s medical practice written by experts in the field. The evolution in health care has created even a greater need for business savvy physicians and has also created a entire niche of financial advisors that focus on advising these business owners physicians. And, this text fills the gap left by Medical Schools and MBA programs that do not cover this subject matter with any degree of competency. As a physician financial advisor I found the information about various aspects of medical practice management very useful in understanding and advising my physician clients concerning their practices.